Mere minutes after the Sagano Scenic Railway train leaves its terminus in the popular suburb of Arashiyama just outside Kyoto, civilization abruptly falls away. Behind us lies a metropolis of at least a million people; out the windows, the only signs of life are a few Japanese macaques cavorting among the trees on the hillside. 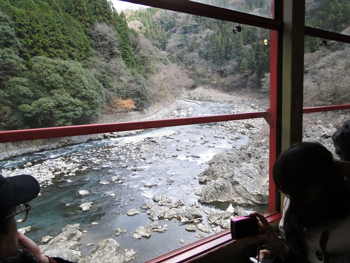 With big bay windows running the length of each train car, it's easy to soak up the view of the Hozu River as it twists and curves its way through Kyoto's western mountains. Cherry and maple trees line the tracks, and pepper the opposite riverbank. In spring and fall, the gorge is awash with color. Winter brings a more muted scene, but as the temperature plummets, the possibility of witnessing a magical snowy landscape grows exponentially. The railway, in business since 1991, may not boast the longest train route in Japan at only 20 minutes, but that short time is enough to transport travelers from the bright lights of the city to the quiet valleys of the uncelebrated areas of Kyoto Prefecture. 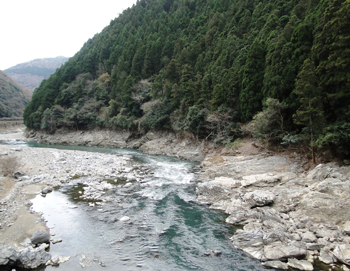 Most visitors who ride the railway to the end of the line in Kameoka return almost immediately to Kyoto by riverboat, riding the (rather gentle) rapids downstream for about 90 minutes to the famous TogetsukyoBridge in Arashiyama. For more intrepid souls, a journey deep into the prefecture's Nantan region leads to the picturesque thatched village of Miyama Kayabuki. Shirakawa-go and Gokayama in nearby Gifu Prefecture are perhaps the best-known communities in Japan that boast traditional, thatched-roof homes built in the gassho zukuri (praying hands) style. Unfortunately, their notoriety and UNESCO World Heritage status have resulted in the villages being overrun by tour buses and hordes of visitors from morning to night. 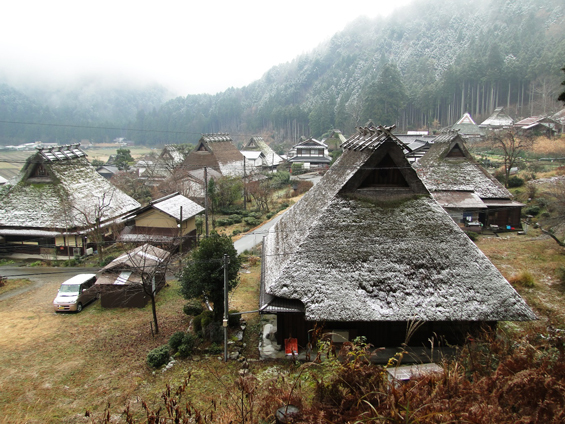 Miyama Kayabuki boasts an impressive total of 39 thatched-roof homes, yet receives only a fraction of the crowds. By the time our bus pulls into the parking lot outside Miyama, the light rain that was falling in Kameoka has turned into large wet snowflakes. A layer of fresh powder coats the village roofs while the surrounding trees stand silent in frozen majesty. A thick mist roils around the tops of the mountains, but the occasional patch of blue sky bursts through the cloud cover. We all disembark but cluster around the coach for a moment, almost afraid to shatter the rustic scene that looks like the spitting image of an old ukiyo-e (woodblock print). 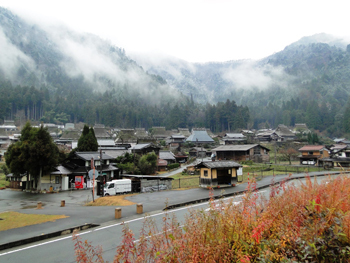 The lanes of Miyama are mostly silent, with residents wisely staying indoors during the inclement weather. While Shirakawa-go and Gokayama can often feel like movie sets or “museum” communities, Miyama is a living village. The sound of hammers rings out over the valley, the hypnotic rhythm of carpenters at work on the frame of a new home. Nearby, a house boasts fresh bundles of thatch on its sloping roof. A small playground near the northern edge of town speaks to the resiliency of the population. With at least a half dozen children who attend the local school, Miyama is not just a town with seniors over 70. A small folk museum with a robust heater and free cups of tea showcases farming equipment and various village paraphernalia in one of the village's photogenic homes. The most enjoyable activity here, however, is a stroll through the narrow streets themselves. Late season persimmons hang heavy on garden trees as melting snow drips off the tips of the thatch. Traditional homes are interspersed with the occasional modern-roofed cafe or craft workshop. A small indigo museum — sadly closed on the day of our visit — intrigues us enough that we peer in the windows to try to catch a glimpse of the vivid blue cloth. At the edge of town, slick stone steps lead to a tiny shrine with sweeping views over the valley. In such a small village, lunch options are slim, but we happily settle in to a private dining room in Matabe, Miyama's only minshuku (guest house) where the hosts serve up a tasty set meal of local vegetables, rice, miso soup and the region's famed black beans. The tempura plate is an immediate favorite, with heartily battered mushroom, onion and pepper served with a side of wasabi salt. While the city of Kyoto offers up the widest range of accommodations in the area, what it can't claim are any natural hot springs. By early afternoon, we head back to Kameoka, where the Keburikawa Hotel boasts a variety of onsen sporting clear views of the nearby mountains. The main baths are open to the public daily from 11 a.m.-4 p.m., but for the right price, overnight visitors can soak in their own private rotemburo on the veranda attached to their room. While it's tempting to spend all evening just enjoying the waters, the menu at the attached restaurant is too tantalizing to miss. 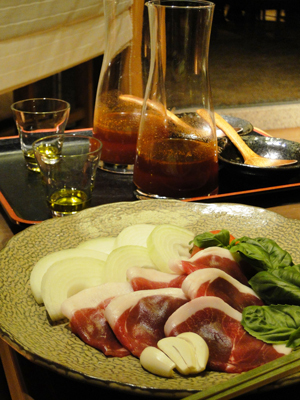 Delicacies like yellowtail and fugu — imported from the coastal regions — are certainly enjoyable, but the highlight of the meal is, without doubt, the meat. Thin slices of boar in a sweet tomato sauce are cooked up for us sukiyaki-style by our server, with locally foraged shitake mushrooms offered on the side almost as an afterthought. A small portion of stone-cooked regional beef comprises the main course. Paired with the choice of soy sauce, grated yuzu or a mellow miso, the rich flavors are the perfect end to a substantial dinner. Forgoing the usual coffee, we end the meal with cups of delicate tea brewed from local black soybeans. The air is more than brisk by the time I make it back to my room and prepare for a long soak in my private onsen. Despite the initial unwelcome chill of using the outdoor shower, any shivers are quickly banished by the steaming water. I can see nothing beyond the bamboo fence of my veranda save for a handful of stars scattered across the inky black sky. The lights of Kyoto may be a short train ride away, but here in the Nantan region, there is only silence and the sense of the undiscovered. Tickets for the Sagano Scenic Railway can be purchased at either JR Kyoto Station or Saga Torokko Station in Arashiyama. Reaching Kaiyabuki Miyama traditional village can be difficult by public transportation; a hired car or taxi is recommended. For more information on the Keburikawa Hotel, visit its website at http://www.keburikawa.com/ (Japanese only).